People ask me, “So what is it like out there…I mean dating after 50”. My answer is an unequivocal, “It’s an adventure”. Step one, set aside your fear. Yes, there will be rejection. Best to deal with that one head on. The good news is, mid-lifers have more experience coping with rejection than our younger counterparts. Although you may feel more vulnerable now, recall a time when you were passed over for a job or belittled by your former spouse or significant other. You lived through it and likely learned a bit more about yourself, another and perhaps life in the process. Dating comes with its share of dings and boosts. Ride the wave. If you are an analytical type, you may find dating much like shopping for a new car. Which characteristics are critical, which are preferable and which are deal breakers? How much effort do you want to put into test driving? Is reliability or thrill more important to you? If you are more of an experiential type, dating may simply be a matter of time, geography and effort. Regardless of your personality, you will likely find yourself considering one or more of the following options to begin the dating process. Online dating – There are subscription sites, free sites, generic and targeted. The biggest advantage of online dating is convenience. You can view profiles and communicate anywhere and at anytime. You can assess the level of interest and control the pace. Users are high in number and diverse. The disadvantages are dishonesty, subscription obligations, choice overload (“kid -in -candy-store” syndrome) and stereotyping. Meet ups – If you are not yet familiar with what meet-ups are all about, no time like the present to educate yourself. Meet ups are online social networking portals that facilitate offline group gatherings. They have been around since 2002 and have become increasingly popular as a means for singles to connect. It is as simple as googling “meet up” and narrowing down options to those of interest to you. The big advantage of meet-ups is face to face contact in an environment of mutual interest. The disadvantage is not everyone you encounter will be available for or interested in dating. Introductions – If you have a trusted friend or relative who wants to introduce you to a colleague or neighbor…go for it! Remember dating is an adventure. Keep an open mind and have fun. Dating services – Personalized dating services appeal to persons who wish to have a go between for selection and communications. The big disadvantage is cost. They start with initial fees in the $3,000 – $8,000 range. Service providers argue this disadvantage is actually an advantage because it narrows the field to those seeking quality rather than quantity. Whether true or not, it is safe to say dating services have a limited pool of subscribers. Community activities – Think local non-profit committees, church/synagogue/mosque membership, coaching, fund raising events, board roles etc. This option is a win/win. A common criticism of dating is the amount of time wasted. No such concern here. You can serve others, while putting yourself in a position to meet solid potential daters. Chances are even if you don’t personally meet that special someone, your good deeds will not go unnoticed and one of your contacts will know of a perfect dating candidate. Refer to “Introductions” above. Learning circles – Have you been to an Apple Store recently? All the classes are brimming with mid-lifers. Likewise for college adult education classes. It is incredibly easy to strike up a conversation in any learning environment. What could be more adventurous than taking on a new challenge and sharing the learning experience with a stranger? The disadvantage from a date searching perspective is that learning circles are not a targeted approach to identifying daters. But if you are a believer in serendipity, this option or a group travel opportunity has appeal. 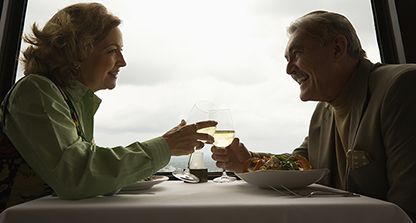 Meeting your next perspective date in a bar, airport, grocery store, car wash, ball game or at work is as likely to occur at age 50 + as it is at age 25. If someone catches your attention, use body language, eye contact, a smile and friendly approach to assess interest. If you get a good vibe…get a phone number. Regardless of your methodology, be open-minded and kind. Keep in mind there will inevitably be setbacks in the dating process and that sometimes success is just dumb luck. Are you navigating obstacles in your relationship? Click here to take the couple checkup relationship assessment!